SGPC president Avtar Singh has favoured chemical testing of the Kalgi, said to be worn by Guru Gobind Singh, to cross-check its (relic’s) age, but the research team comprising Punjab cadre IPS officer Harpreet Singh Sidhu and Kamaljit Singh Boparai have opposed this. The report prepared by the duo states: “The research team’s conscience and belief did not permit it to take samples or dissecting/cutting material from the Kalgi for chemical tests to ascertain it age etc. As the research team is not willing to venture into this area, it is open to Sri Akal Takht Sahib to pursue this option. However, the team said, for the purpose of information, it is pointed out that according to expert opinion there is no chemical test that can be conducted on the Kalgi”. The report claimed that research began on broad parameters and keeping in view verifiable points the search narrowed in a phased manner. “This approach is also the reason that it has taken the research team many years of work in India and overseas to gain possession of the Kalgi”. 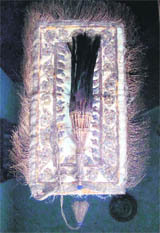 However, the team in its report has said they did not want to reveal the names of the persons who possessed the relic. “Owing to reasons of confidentiality, the research team regrets that the identity of the collector/group of collectors from whom the possession of the Kalgi was eventually obtained, cannot be disclosed”. The report said the issue was to examine whether the Kalgi recovered by the researchers was indeed the original Kalgi of Guru Gobind Singh. “Quite obviously, there is no eye-witness to prove that the Kalgi is indeed the one worn by Guru Gobind Singh or an unbroken line of publicly documented and acknowledged ownership. Had the matter been public knowledge, the Kalgi could have been recovered many decades earlier. The researchers have therefore pieced together facts to examine the authenticity of the Kalgi”. The report states the possession of the Kalgi by Maharaja Ranjit Singh is proved from the records of the Lahore Durbar and other sources.